Stunning and can be worn at any occasion – ***Weddings/Parties/Holidays***, unusual design, silver/golden/multi, inset with diamanté. Stretchable which fits all sizes. 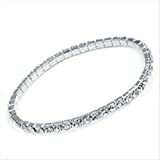 Perfect and will look stunning on any occasion..Add your night a bit spark and seductive sensuality, this eye-popping anklet is a must-have for every woman’s jewellery box and perfect to complete the flirtatious look. Please Note: No Returns on product due to Hygiene reasons! Our jewellery is Mont Cherry Brand jewellery and only Trendz are authorised sellers for Mont Cherry jewellery.